When you have cabin fever or need little pick me up we suggest you venture to North Myrtle Beach, South Carolina for a beach vacation. Sometimes the only medicine you need is a daily dose of the coast. Nestled in the Cherry Grove section of North Myrtle Beach, SC is a North Myrtle Beach resort that puts your family across the street from the beautiful beachfront and just a couple blocks away from the salt marsh channels. Channel Marker is a charming North Myrtle Beach resort with a swimming pool, ocean view balcony in each North Myrtle Beach condominium and spacious lodging for up to six people. Pack your bathing suits, grab your sunglasses and come to North Myrtle Beach, South Carolina for a fantastic beach vacation. Channel Marker features North Myrtle Beach vacation rentals that have two bedrooms. Each of these North Myrtle Beach condominiums has two baths, as well. There is nicely furnished kitchen in these condos in North Myrtle Beach, South Carolina and they all boast the convenience of a dishwasher. Additional features of these North Myrtle Beach condo rentals are the high-speed Internet access, DVD player and washing machine and clothes dryer. These North Myrtle Beach vacation rentals are brimming with all the modern conveniences of home so that you will feel right at home during your North Myrtle Beach vacation. These non-smoking North Myrtle Beach rentals have ocean views from their balconies, though you are only steps away from enjoying the beautiful oceanfront with your bare feet sinking into the warm sand when you stay at Channel Marker. This three-story North Myrtle Beach resort is on stilts so there is covered parking on the ground level. 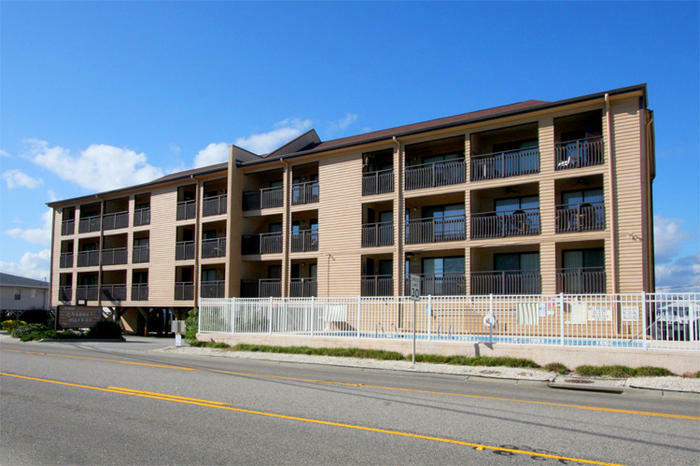 Stairs are conveniently located at both ends of the hallway at Channel Marker and the swimming pool is easily accessible for all guests of this North Myrtle Beach resort. There is even a grill area at Channel Marker so you can have a barbecue outdoors during your North Myrtle Beach vacation. Unpack your bags and settle into the seaside ambiance at this North Myrtle Beach resort. You can see the Atlantic Ocean from the living room and master bedroom of these North Myrtle Beach vacation rentals so you are constantly reminded that you are indeed at the beach. Sunlight streams into your private North Myrtle Beach rental and makes a nice wake-up call early in the morning of your North Myrtle Beach vacation. Elliott Beach Rentals is not affiliated with onsite management or the HOA of Channel Marker.